Love is in the air! And by love, I mean cookies. Ok, I guess it does happen to be Valentine’s Day soon, so posting a red cookie recipe might have been on purpose, but do you even really need a holiday to make cookies? The answer is no. Every day should be a cookie kinda day. Valentine’s makes an extra good cookie kinda day in my book. There are few things more seductive than the aroma of fresh baked cookies. Whether the targeted seducee goes for you or for the cookies is a toss up, but hey, at least there’s cookies. 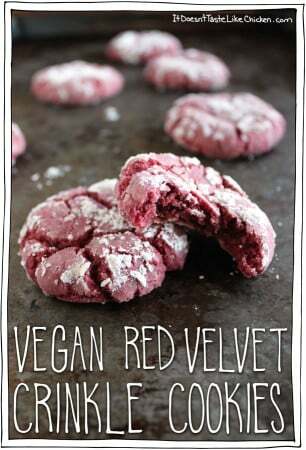 Not just any cookies either, Vegan Red Velvet Crinkle Cookies! (In case you didn’t notice the giant white words on the photo right above this paragraph). These cookies are crisp on the outside with a chewy centre. 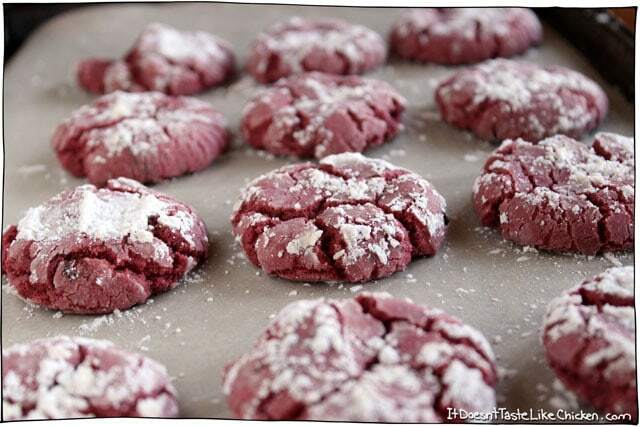 That classic red velvet taste, all squished into one perfect little powdered sugar covered crinkled cookie. 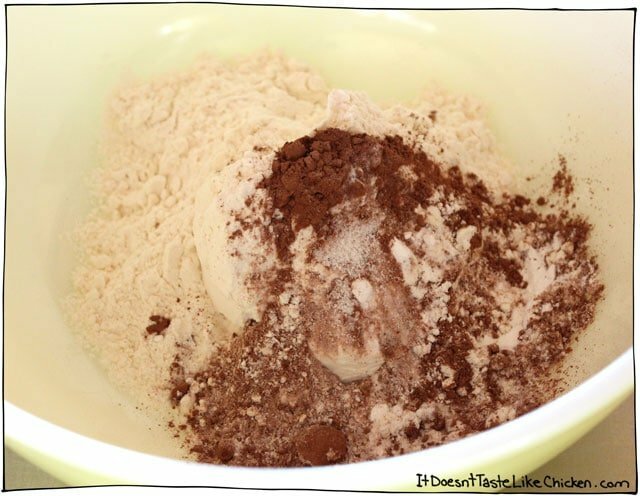 In a large bowl, whisk together flour, cocoa, salt, baking soda, and baking powder. In another bowl cream vegan butter with the sugar. When it is fluffy and creamy looking, mix in the maple syrup, non-dairy milk, vanilla extract, and food colouring. It will probably look a little speckled like in the picture, and that’s totally cool. Pour the wet mixture into the dry, and mix until a dough is formed. *A note on food colouring: Make sure the brand of food dye you buy doesn’t contain carmine. It’s not vegan. What is it you ask? BEETLES!!!! Ew. Believe it or not, this red beetle is found in lots of processed foods that are red in colour. Pretty weird huh? Now I know some of you prefer more natural colours, so if you are looking for an alternative, try my Beet Chocolate Chip Cookies. Scoop up a heaping tablespoon of the dough and lightly roll into a ball. Put the powdered sugar in a flat dish and roll the dough ball around. Place the dough ball on a parchment covered baking tray, and lightly press the ball down a little. Sprinkle a little extra powdered sugar on top, because hey, sugar. Try not to lick your fingers. Bake at 350F (180C) for about 12 minutes. They will come out looking all crinkley and fun. 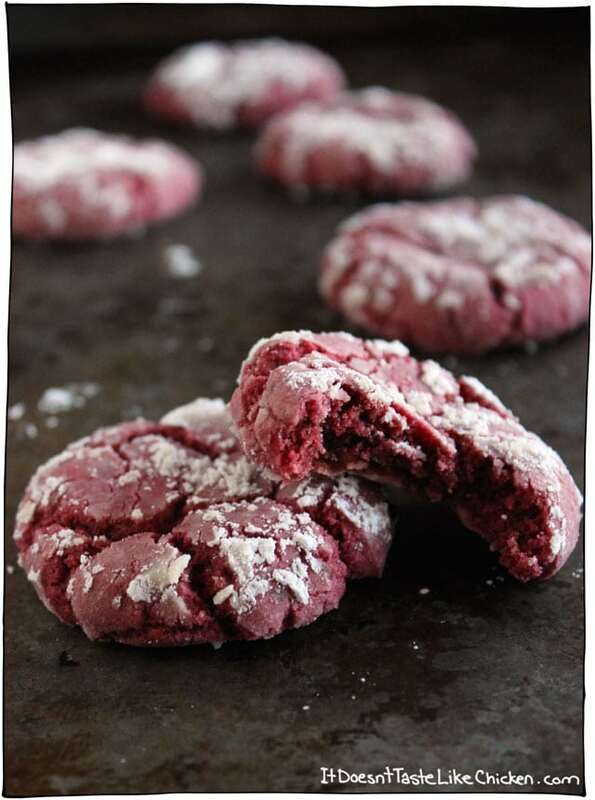 Vegan Red Velvet Crinkle Cookies. A super cute treat to make for Valentine's Day, or just any day that you need a cookie. (Which is every day). Preheat your oven to 350F (180C). Cover two baking trays with parchment paper and set aside. In a large bowl, mix all the dry ingredients and set aside. In a medium bowl, cream the vegan butter and sugar together until creamy and fluffy. Mix in the maple syrup, non-dairy milk, food colouring, and vanilla extract until blended. (It's ok if you see little flecks of the vegan butter in the mixture). Pour wet into dry and mix until the dough comes together. Put the powdered sugar in a wide bowl or dish that has enough room so you can easily roll a dough ball in there. Take a heaping tablespoon of dough and gently roll into a ball. 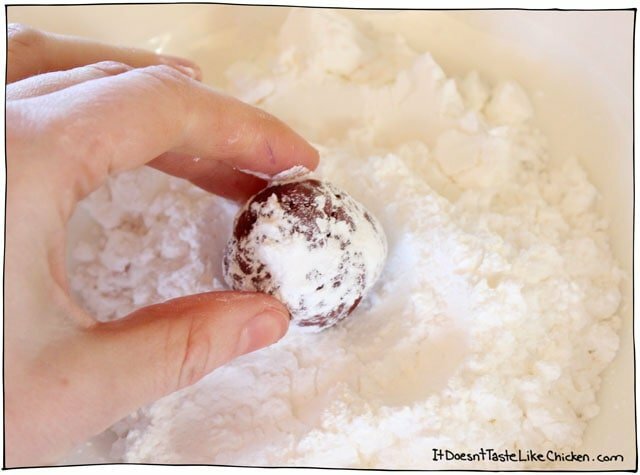 Roll the ball into the powdered sugar so that it is completely covered. Set on the baking tray and lightly press down so the ball is slightly flattened. Sprinkle a little extra powdered sugar on top. Repeat with the remainder of the dough to make 24 cookies. Bake for 10-12 minutes. Remove from oven and let cool for 10 minutes on the trays. Feature Ingredient: Red. Powdered Sugar. 132 Days, 59 Recipes to Go! I’m curious – are the photos of your cookies taken after full cooking time? My cookies flattened (even with chilling the dough for several hours). What brand of vegan butter did you use? Did you let it soften? How long did you beat? The cookies are delicious but very dense (as opposed to cakey/fluffy). Yes, the cookies are cooked in the photo. These are a firmer cookie, and I wouldn’t describe them as cakey or fluffy. For a cakey cookie try my Vegan Soft Frosted Sugar Cookies. My go-to vegan butter is always Earth Balance and there is no need to soften it as it gets soften when beaten with the sugar. Hope that helps! That’s so odd! I use earth balance as well. I did let it soften beforehand and maybe that was part of my issue. I’d be curious to see how long you beat in between each step. I have made these a few times now and have the same result each time. Delicious but don’t look like the photo! That is weird. I just mixed until it combined. Sorry, yours didn’t turn out the way you (or I) expected! That’s ok! I am just curious to find out why! 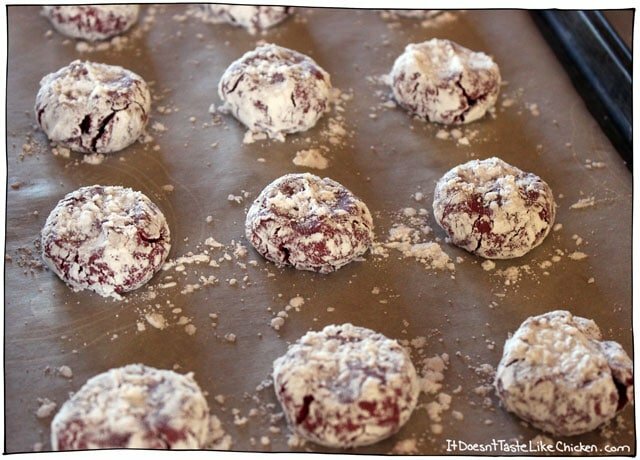 can beets be used in lieu of food coloring, almond flour and coconut sugar? will those subs ruin it? I haven’t tried those substitutions myself so I can’t predict the results. 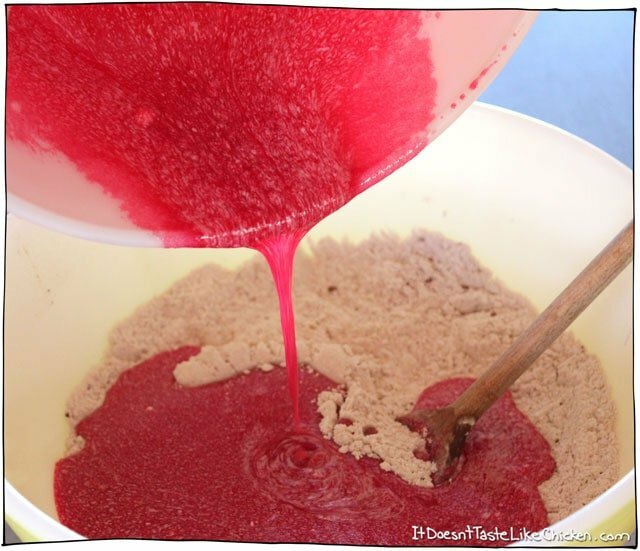 You could try this recipe to make your own beet food dye. Enjoy! Hello!I would like to know if I have to put the food coloring cuz I’d rather not to. Nope, but the cookies won’t be red without it. Delicious! Excellent chewy texture. I messed up the order of wet ingredients a bit but they still turned out great. Thanks! Thank you for this recipe! My husband has made these for years. Every year since we found the recipe. We take them for Xmas gatherings with family. Everyone expects them so we make several batches. These are one of my favorite things about the Xmas. Thank you!!!! Hi! This recipes looks good. I’m going to make a batch for a friend’s wedding. Do you think I can safely add chocolate chips at the end? Have you tried? Thanks! I haven’t tried, but it should work fine. Enjoy! Can’t find vegan butter here – do you think oil will work out? And maple syrup too, can I use honey instead? Thanks! Hi Sarah, I wouldn’t recommend oil for a cookie recipe. Did you check the margarines in your area, if they are dairy free then they are good to go! I also wouldn’t recommend honey as it isn’t vegan. Hi! My cookies look awesome, but they turned out dry and crumbly. Any ideas on what may have gone wrong? Glad you enjoyed them, Kelsey! It sounds like might have been overcooked slightly. Try taking them out of the oven a couple of minutes earlier next time so they are nice and moist. EnjoY! I just made these and they were perfect! I just added 2 extra tablespoons of cocoa for a little added chocolate flavor! The kids and hubby love them! I’m definitely making them for Christmas! Hi there! I’m wondering if this recipe would work with bob’s red mill gluten free all-purpose flour? Hi Tara, I’m not gluten-free so I don’t know. Sorry I can’t be more help! I am hoping to make these for an event next week, and do to timing would need to freeze them. Do you know if they freeze well? Tried these cookies and they turned out as flat as paper, even after chilling the dough after the first batch. Pinterest fail! Oh no! I’m so sorry to hear that. Did you by chance melt the butter first? That would make them flatter for sure. Should they have more flour? Like maybe 2 1/2 cups instead of 1 1/2? My cookies melted into one bloody mess. Nope, the recipe is correct as written. Did you perhaps melt the vegan butter first? The butter should be solid when you make the cookies, and then you cream it. Huh, that’s so weird! Difficult to know what went wrong without being in the kitchen with you. If you accidently used too much sugar, that would make them too sweet and too melty, so maybe that was the problem. Who knows! Crazy, but very possible (I tend to rush). I’ll keep trying until I get it right! Thanks again. I baked these last night. They are delicious! I can’t wait to share them with my oldest daughter, who is vegan. Red velvet had been her favorite! 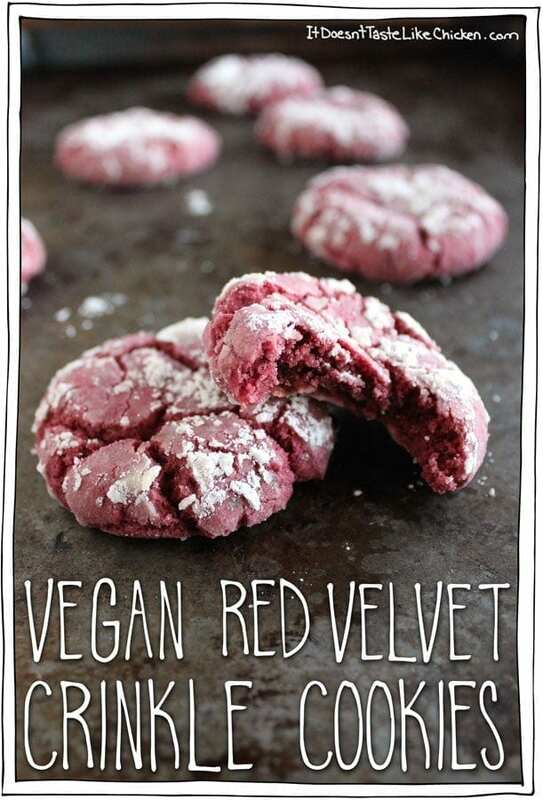 Hi these look great, but I was under the impression red food coloring is not vegan. Is that not true? And if it is, is vegan red dye easy to find? Hi April, some brands are vegan and others are not. I used McCormick food coloring which from my research appears to be vegan. I have also heard that Wiltons food coloring are vegan, but their colors are a lot more concentrated, so if you use them, you will need a lot less. If you are unsure of the brand you are considering, a quick google search should help you out. What you want to avoid are the words: Carmine, which also goes by the names Crimson Lake, Cochineal, Carminic Acid, and Natural Red #4. Those red colours are made from beetles. Perfect, thank you for your help!! These look great! I’m going to try. One word, I hope you don’t mind me sharing….white sugar is not vegan…..it is processed through charred animal bones often. Other than that, your recipe hits the vegan notes. And thanks for info on red coloring. I knew about carmine but not in food dye. I’ll post review later. In the US, sugar is often processed with bone char, but in Canada and other parts of the world, it is not. You can always double check with the company to make sure that the sugar you are purchasing is bone char free, Redpath is a common brand in Canada and both totally vegan. In the US all organic sugar is free of bone char. Hope that helps! Thanks for the recipe! Made these today, accidentally put in a bit too much soya milk and then had to add a bit more flour (this kind of thing usually happens to me in baking) and the colour went a bit paler than your pictures but other than that – delicious! Yay! So happy they worked out even with your little bloopers. Haha. Cookies for the win! 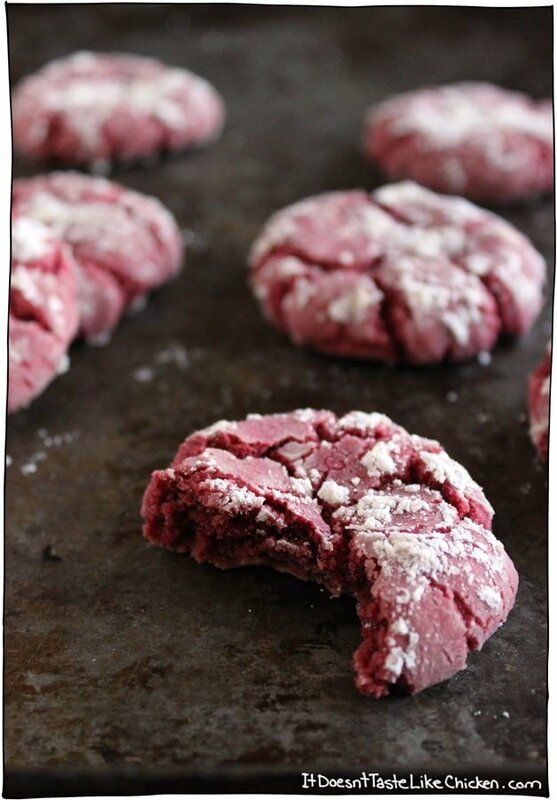 Can you use beets in this recipe in place of the red food coloring? I wasn’t sure if you were implying that you could by linking to your red chocolate chip cookie recipe or if you were saying that if you wanted to use the beets, then just make the chocolate chip cookies INSTEAD. Thanks! I have red food coloring, but I’m used to only using a few drops – this recipe calls for 3.5 t which is a LOT!! I’m going to try it tonight and will just experiment with the coloring and see how it comes out. Yeah, that’s the nature of red velvet anything. You can use less if you prefer, but your cookies will be in the pink side. I hope you enjoy them! Hi! I really want to make this recipe tonight, the cookies look amazing! but we don’t have vegan butter in my country 🙁 do you think I could use oil instead? You could try coconut oil. It might work ok, but since I haven’t tried it myself I can’t know for sure. Hope that helps! My daughter is vegan so I made these last night for our holiday spread, they are absolutely delicious! My cookies spread out quite thin though, do you suggest a bit more flour or did I do something wrong? So happy you enjoyed them! It could be that your dough just got a bit too warm, you could try chilling it before baking the cookies. Hope that helps! These are cooling right now and I am almost dying in anticipation! Well don’t dye! Then you won’t get to eat your cookies, haha. I hope you enjoy them Andee! Yes that’s true! Same goes for white granulated sugar. You can usually check out the brands online. I hope you enjoy the recipe Nettie! Yes! The more people see vegan food as delicious, scrumptious, familiar looking food to be devoured up and lick the plate, the more they will WANT to eat vegan. 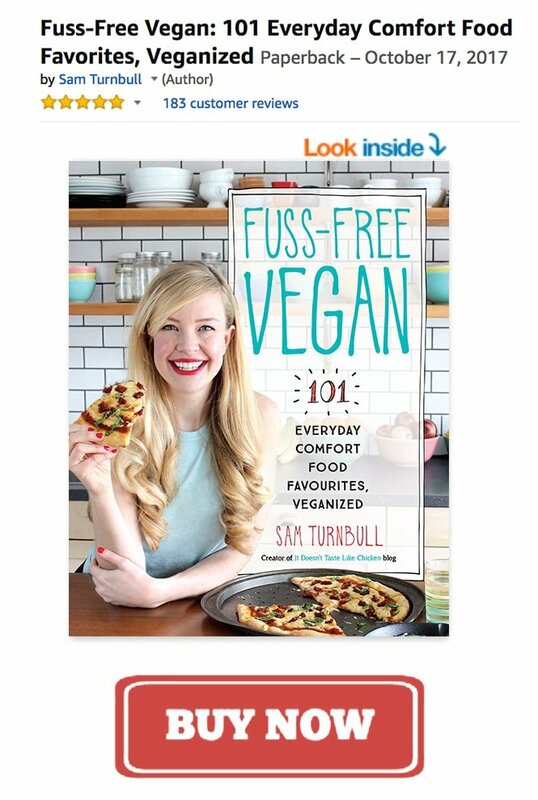 That’s what I am trying to do by providing delicious vegan recipes. Break that barrier. Vegan food isn’t as weird as it sounds, it’s just food!